Students at the Device Research Lab (DRL) in MIT’s mechanical engineering department have designed and tested a coated surface of an industrial plant condenser with nanostructured patterns that greatly increase the heat-transfer coefficient. The heat-transfer coefficient is important when it comes to condensers because it is a measure of how fast heat can be transferred away from it. Basically, it is the opposite of insulation where insulation is a measure of how long heat can be maintained. The purpose of a condenser in an industrial plant, like a thermal power plant for example, is to condense water vapor back into steam for maximum efficiency and reuse the now transformed liquid water in the steam generator or boiler as boiler feed water. A condenser with a high heat-transfer coefficient would then be able to condense water vapor faster and more efficiently. Nanotechnology, specifically nanostructures, have been proven successful in creating materials or devices that perform in a particular way, usually increasing its efficiency in the process. Nanostructures are objects created at the nanoscale or atmolecular level. These are very tiny structures and creating a nanostructure involves manipulating an object's composition at a molecular level. It may involve moving molecules or atoms around, or creating patterns that will allow it to behave in a particular way. These structures are made to either act as a container in a delivery system (like gas atom/molecule in a very tiny capsule), interact with other objects to achieve a predetermined outcome either structurally or chemically or to act as a base for a more complex structure. In relation to the condenser created by MIT, the surface was coated with nanostructured patterns to influence the way water droplets behave on it (see embedded video below). Many industrial plants depend on water vapor condensing on metal plates: In power plants, the resulting water is then returned to a boiler to be vaporized again; in desalination plants, it yields a supply of clean water. The efficiency of such plants depends crucially on how easily droplets of water can form on these metal plates, or condensers, and how easily they fall away, leaving room for more droplets to form. The key to improving the efficiency of such plants is to increase the condensers’ heat-transfer coefficient — a measure of how readily heat can be transferred away from those surfaces, explains Nenad Miljkovic, a doctoral student in mechanical engineering at MIT. As part of his thesis research, he and colleagues have done just that: designing, making and testing a coated surface with nanostructured patterns that greatly increase the heat-transfer coefficient. The results of that work have been published in the journal Nano Letters, in a paper co-authored by Miljkovic, mechanical engineering associate professor Evelyn Wang, and five other researchers from the Device Research Lab (DRL) in MIT’s mechanical engineering department. On a typical, flat-plate condenser, water vapor condenses to form a liquid film on the surface, drastically reducing the condenser’s ability to collect more water until gravity drains the film. “It acts as a barrier to heat transfer,” Miljkovic says. He and other researchers have focused on ways of encouraging water to bead up into droplets that then fall away from the surface, allowing more rapid water removal. “The way to remove the thermal barrier is to remove [the droplets] as quickly as possible,” he says. 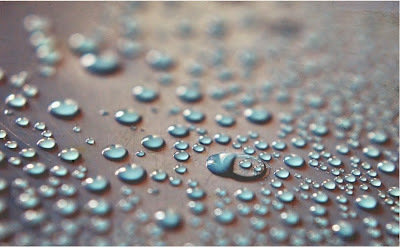 Many researchers have studied ways of doing this by creating hydrophobic surfaces, either through chemical treatment or through surface patterning. But Miljkovic and his colleagues have now taken this a step further by making scalable surfaces with nanoscale features that barely touch the droplets. The result: Droplets don’t just fall from the surface, but actually jump away from it, increasing the efficiency of the process. The energy released as tiny droplets merge to form larger ones is enough to propel the droplets upward from the surface, meaning the removal of droplets doesn’t depend solely on gravity. Other researchers have worked on nanopatterned surfaces to induce such jumping, but these have tended to be complex and expensive to manufacture, usually requiring a clean-room environment. Those approaches also require flat surfaces, not the tubing or other shapes often used in condensers. Finally, prior research has not tested the enhanced heat transfer predicted for these types of surfaces. The patterning is done, Miljkovic says, using a simple wet-oxidation process right on the surface that can be applied to the copper tubes and plates commonly used in commercial power plants. The nanostructured pattern itself is made of copper oxide and actually forms on top of the copper tubing. The process produces a surface that resembles a bed of tiny, pointed leaves sticking up from the surface; these nanoscale points minimize contact between the droplets and the surface, making release easier. After the leaflike pattern is created, a hydrophobic coating is applied when a vapor solution bonds itself to the patterned surface without significantly altering its shape. The team’s experiments showed that the efficiency of heat transfer using these treated surfaces could be increased by 30 percent, compared to today’s best hydrophobic condensing surfaces. That means, Miljkovic says, that the process lends itself to retrofitting thousands of power plants already in operation around the world. The technology could also be useful for other processes where heat transfer is important, such as in dehumidifiers and for heating and cooling systems for buildings, the authors say. Challenges for this approach remain, Miljkovic says: If too many droplets form, they can “flood” the surface, reducing its heat-transfer ability. “We are working on delaying this surface flooding and creating more robust solutions that can work well [under] all operating conditions,” he says. The research team also included postdocs Ryan Enright and Youngsuk Nam and undergraduates Ken Lopez, Nicholas Dou and Jean Sack, all of MIT’s mechanical engineering department. The work was supported by MIT’s Solid-State Solar Thermal Energy Conversion Center, the U.S. Department of Energy, the National Science Foundation and the Irish Research Council for Science, Engineering and Technology.